January’s market figures were a mixed bag with that big red line in the graph below looking rather ominous. 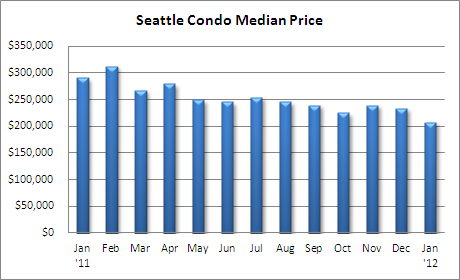 Seattle’s median condo sales price plummeted 28.64% last month to $208,000 compared to last January. It also reflected a one-month dip of 11.1% from December. Granted, it’s just one month and could completely reverse in February. 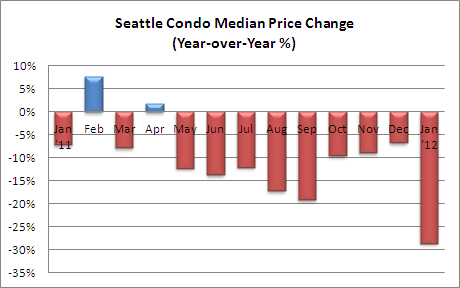 However, it is significant; it’s the lowest citywide median condo sale price since February 2003, a 9-year low. What may be heartbreaking for sellers may offer a boon for buyers. 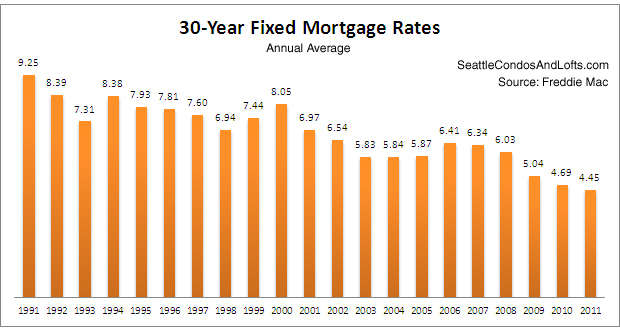 Back in 2003, mortgage interest rates were hovering between 5.5% and 6% for a conventional 30-year loan. With current rates around 4%, buyers are shaving up to $200 off their monthly mortgage payment for a $200,000 loan compared to if they purchased in 2003. 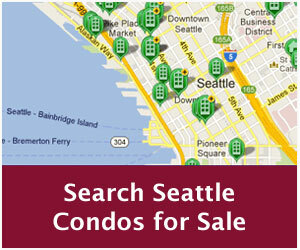 With prices down to 2003 levels combined low interest rates, condos are more affordable than they’ve been in years. 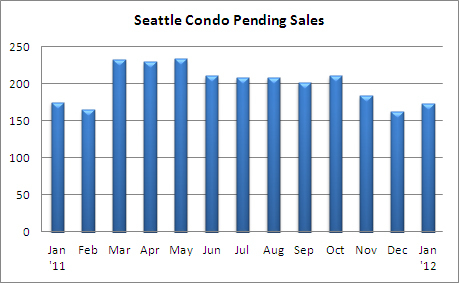 Pending sales improved 6.1% over December to 173 units, but did reflect a 1.1% slide from last January, or 2 fewer units under contract. 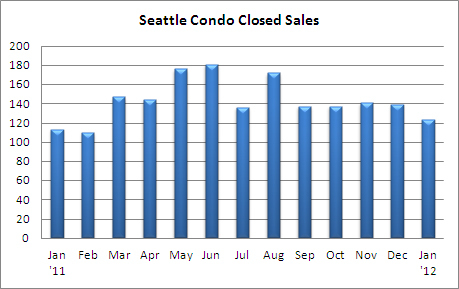 The number of closed sales declined 11.5% from December to 123 units, but increased 8.9% over January of last year. 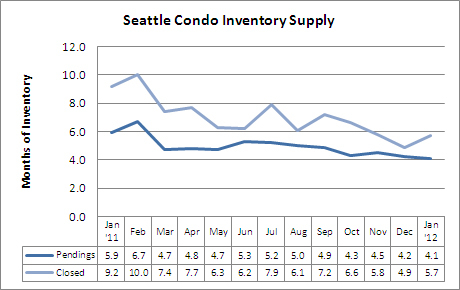 Although inventory rose slightly from December, Seattle’s condominium inventory remains low. 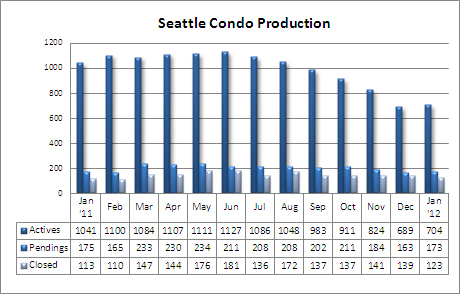 The 704 condo units available in January reflected 32.4% fewer units for sale compared to the same period last year. In the sub-$200,000 price point, inventory is becoming scarce and agents have reported encountering more multiple offer situations. Lower prices and interest rates offer a compelling alternative to renting for many likely first-time homebuyers, but they’re not finding a whole lot out there. On the other hand, the luxury condo market has more than adequate inventory available and we’re seeing more pricing adjustments as high-end units sit on the market. 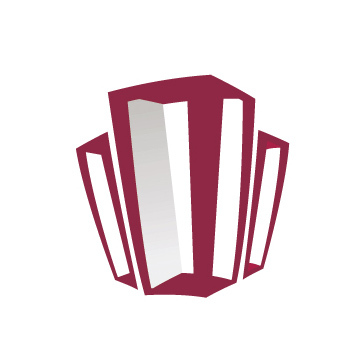 The inventory supply rate tightened slightly based on the rate of pending sales but increased when based on closed sales volume. Currently, Seattle continues to reflect a normal/neutral market condition. That’s probably not likely to change – seasonally, heading into spring we’ll see more listings along with increased sales that should keep the market in balance. A few notes about the year-over-year figures below. Area 700, which includes Queen Anne and Magnolia, is skewed. The 2011 stats include 11 units at the 2200 Condominium complex, which should have been reflected in Area 701 (Downtown, Belltown, Denny Triangle). Excluding those units, the Area 700 median sales price would have been $294,605, resulting in year-over-year decrease of 42% instead of 77.2%. Area 701 was the only area of the city to realize an increase in median sales price, up 10.5% over last January, mainly due to sales of higher valued properties. While most areas of the city saw fewer closed sales, Capitol Hill and North Seattle realized increased closings compared to last year. What’s your opinion about what will happen to valuations when interest rates return to 5-7%? It sounds like this won’t be until 2014, at least if the Obama administration has its way, but that’s not so far away and they can’t stay at 4% forever. Your comment about buyers shaving $200 off their mortgage payment seems like it would be a major motivator (and detractor in 2014), however I don’t have much buyer perspective. Rian – It’s unlikely that rates will remain in the 4’s, but may remain under 5% for a while. Valuations may be influenced by supply and demand and the overall economy more so than interest rates, and for condos, demand has been stable with shrinking inventory. Under normal circumstances we should see values stabilize and increase, possibly by the end of the year given current demand and the fact that there are no new condos in the pipeline. However, the number of foreclosures and short sales are keeping pressure on prices. 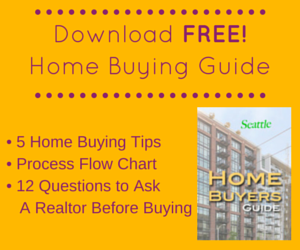 Rising rates may reduce the pool of buyers, which will reduce demand and potentially prices. It will also decrease buying power…rather than a $250,000 at 4%, a buyer may only qualify for $225,000 at 5%. On the other hand, rising rates is also indicative of an improving economy. For what it’s worth, the last time rates were in the 5-7% range, we were in the thick of the housing bubble with record home prices. Though, that’s not likely to be the case when rates do start to rise.